Indium Corporation will feature its semiconductor-grade gold-germanium solder preforms at IMAPS High Temperature Electronics Network 2017 (HiTEN 2017), July 10-12 in Cambridge, United Kingdom. Semiconductor-grade preforms are designed to meet the challenges faced as RF and power semiconductor devices continue to get smaller. Indium Corporation’s high melting point AuGe solder preforms perform well at the elevated operating temperatures of smaller dies with increased power densities. In addition, improvements in wetting make semiconductor-grade AuGe solder preforms critical for void reduction efforts. Gold-based solders have a melting point ranging from 280-1064°C, making them compatible with subsequent reflow processes. Additionally, gold-based solders are resistant to corrosion, provide superior thermal fatigue resistance, and exhibit excellent joint strength. Indium Corporation’s Pb-free and RoHS-compliant preforms are available in a variety of standard and custom-engineered designs. 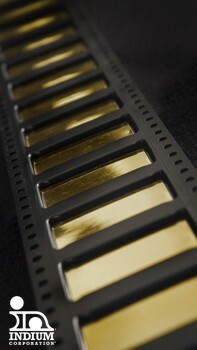 For more information about Indium Corporation’s gold alloy solder preforms, visit www.indium.com/brazealloys.